Rad video. Super fun community there, sometimes I wish I never left. Those green damp woods look awesome right now while California is covered in smoke and the trails are blown out. Keep up with the great content Freehub! Sadly have to sell my shreddy hardtail. The geometry may look a little dated—as fast as things are evolving—but this bike is super fun and playful! Ridden two seasons as an aggressive trail/AM bike. It's in good condition, a few nicks and scratches but nothing alarming. Happy to part out too, feel free to ask about anything! 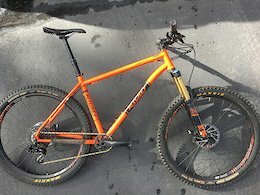 Frame: Ritchey Timberwolf (L), Orange Fork: 2016 Fox Factory 34 TALAS 150/120, 100mm axle (this is over-forked, slackening out the front by about 1º) Headset: Ritchey WCS Tapered Brakes: Sram Guide RS 180 F/R (new metal pads put in late fall) Stem: RaceFace Aeffect 40mm not pictured Handlebar: RaceFace Aeffect 35, 780mm not pictured Grips: Oury, or Ergon GA2 (Orange) Saddle: WTB Volt, CroMo Seatpost: NEW Rockshox Reverb 125mm, 30.9mm Cranks: Sram X1, 30T or 32T BB: Sram GXP, threaded Cassette: e13 TRS 9-42, 10spd Derailleur : NEW Sram GX, 10spd Shifter: NEW Sram GX Wheels: DT Swiss M1800, non-boost Tires: Maxxis DHF 2.35, 3C MaxxTerra (a lot of tread left) The wheelset, tires and seatpost were taken from a new bike I purchased and have been ridden maybe 50 miles. The bike is disassembled and mostly ready to go. I will send the KMC Ti Gold chain, but it's pretty old and will need to be replaced soon. Thanks for looking.